But we had not travelled to Belgium or France for the lovely spears, although they had some frequent flyer miles under their belt getting to us (I know it's the English season!). The pretty bunch of asparagus in front of me were from the Jura via the French deli Le Pascalou on Fulham Road in Chelsea (near the Italian place that is a favourite haunt of She-Who-Must-Not-Be-Named). They get lovely things in there, but boy are they pricey! Check your produce or you'll be paying £8 for a punnet of French strawberries rather than £4 for the English ones. It is Chelsea after all. Have you ever cooked with wild asparagus? I'm a novice with it to be honest, so was at a loss as to where to start. Since this was an impromptu ingredient, my creative options were also limited by what was in the fridge, which was not an awful lot. Since wild asparagus is a much more delicate looking chap than the regular asparagus we all know and love, it was clear it would not need much cooking. So apart from a quick cook, I was at a bit of a loss.I had a quick scan through my most obvious cookbooks, but no luck, so I then turned to the internet for help and some interesting possibilities began to emerge. I saw a few references to Sicilian style fried eggs with wild asparagus, but couldn't find a recipe or description of what made these eggs peculiarly Sicilian. My Locatelli cookbook couldn't help me there either. There were also a few risotto recipes which sounded promising, but I didn't have enough ingredients. Then I came across a fritatta. Eggs? Check! Parmesan? Check! Cream? Check! Apparently Elizabeth David had a wild asparagus fritatta recipe, but I only have an old paperback version of French Provincial Cooking (the revised edition from 1967) which didn't include it, so instead I concocted the following. This should happily feed four with some salad, or even a griddled chicken thigh that was meant to be steamed. Make sure you use a nice deep, oven-proof saucepan for cooking this as it will give you a fritatta with a decent height, otherwise you're just cooking eggs. There's nothing worse than a flat fritatta now is there? Start by gently sautéing your garlic in the melted butter and oil mixture. Add the asparagus, which has been chopped into lengths about two inches long. Leave a couple stems whole for different texture and appearance. Gently fold the asparagus through the oil and garlic. You should start to get a wonderful whiff of asparagus as it part fries, part steams. Mix your eggs, parmesan and cream with some salt and pepper. Pour the egg mix into the wilted asparagus and garlic and stir through. Cook over a low heat for a few minutes before popping the saucepan into the oven for about 10 minutes. I used the CircoRoasting setting on my Neff oven, which basically gives you a bit of top heat from the grill every now and then and helped brown the fritatta rather beautifully. Check the fritatta after about 10 minutes and see how wobbly the centre is. You want to bake it until it is just set but not still runny which can be a little tricky to judge, so keep checking and keep wobbling the pan. When your fritatta is set, remove it from the oven and run a spatula around the outside of the saucepan. This is where a non-stick pan comes in handy. Turn out the fritatta onto a plate and there is your lovely dinner. 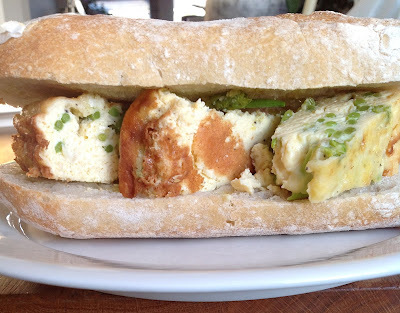 If you should have any leftovers, dinner or lunch the next day could be a really tasty bocadillo. Just get some crusty bread like a baguette and slice it in half. Drizzle some extra virgin oil over the cut halves and lay over slices of your fritatta. Squish it together and you'll be back in San Sebastian. Well, sort of.